Sunday, May 14, noon: The first performance will return to Southern Pacific Brewing, one of the venues for the Sing It Yourself Messiah. This is located at 620 Treat Avenue, just south of 19th Street and east of Folsom Street. Southern Pacific Brewing serves as host in the hope that those who come will also be customers. However, seating will be limited. GGSOC is not charging for admission to the concert, but a donation of $20 is suggested. Sunday, May 21, 2 p.m.: The “official concert performance” will take place a week later at Herbst Theatre, whose entrance is on the first floor of the Veterans Building at 401 Van Ness Avenue. This is located on the southwest corner of McAllister Street, making it convenient for both east-west and north-south Muni bus transportation. premium seating in the Boxes will be $45, Orchestra seating will be $35, the Dress Circle will be $30, and the Balcony will be $25. Tickets may be purchased in advance online from a City Box Office event page. A little over a week ago the Polish label CD ACCORD released the recording debut of the AdAstra Piano Trio. Also based in Poland, the group consists of violinist Anna Szabelka, cellist Łukasz Frant, and pianist Joanna Galon-Frant. The title of the album is Episodi, which is taken from the first selection, “Episodi e Canto perpetuo” (episodes and perpetual song) by the Latvian composer Pēteris Vasks. In fact the entire album is devoted to American and Eastern European compositions written during the last century. At the very least this is a refreshing change from piano trios that feel determined to establish their chops through familiar nineteenth-century repertoire, daring to cross over into the next century only for the likes of Maurice Ravel or possibly Dmitri Shostakovich. The American composers on the album are Henry Cowell (his 1965 “Trio in Nine Short Movements”) and Paul Schoenfield (his 1985 thoroughly loopy three-movement “Café Music”). The other Eastern European is the Russian composer Rodion Shchedrin, represented by a 1997 piece that Grove Music Online translates from the Russian as “3 Merry Pieces,” which is apparently based on much earlier pieces composed for solo piano. Unfortunately, Schoenfield’s over-the-top sense of humor has not translated well to this recording. In fairness, however, it may be the case that it does not translate well to any recording. The very sight of three highly disciplined performers deftly jumping through all the hoops set up by Schoenfield’s score is as much a part of the fun as is the music itself. When it comes to comedy in music, the Shchedrin selection fares much better on recording, particularly the second of the three pieces, whose title in English translates into “Let’s Play and Opera by Rossini.” Structured as a coloratura aria with an introductory recitative, the piece indulges shamelessly in Rossini quotes and packs no end of low-comedy gags into a little more than two minutes. For this listener, at least, Shchedrin having fun with Rossini is a lot more satisfying than the fun he had with Georges Bizet when he prepared a score for a ballet about Carmen choreographed by his wife Maya Plisetskaya. The more serious selections by Cowell and Vasks lead the listener into more exploratory domains. Both composers were interested in the technical potential of all three of the instruments in both solo and ensemble capacities. Furthermore, each of the two compositions amounts to a series of relatively brief studies. One might regard them both as sets of études; but these are “studies” directed at the ears of the attentive listener, as well as at the technical skills of the performers. From this point of view, the opportunity to revisit the Vasks composition turned out to be a very welcome one, while my reaction to the Cowell pieces simply involved wondering why I had to wait so long to listen to them for the first time. How long will we have to wait before AdAstra makes their first tour of the United States? Thollem McDonas is one of the more imaginative performers to make regular visits to the Bay Area in pursuit of “bleeding edge” avant-garde performances, whether they involve improvisation, playing from scores, or some combination of the two (such as when graphic scores are involved). I first encountered him in the summer of 2014 when he led a workshop on collaboration and improvisation for the 13th Annual Outsound New Music Summit. About a year ago, he came to San Francisco as half of the Silver Ochre duo (the other half being videographer ACVilla); and the two of them presented a “progress report” of their Who Are US 2016 project. According to my records, the last time he was here was to play a solo piano set at the Outsound Presents SIMM (Static Illusion Methodical Madness) Series this past November. Next month McDonas will return to present a “double memorial” concert at The Lab. He will perform two works written to honor the recent deaths of two of the major influences on current avant-garde practices, Pauline Oliveros, who died on November 24 of last year, and Stefano Scodanibbio, an Italian composer who died in Cuernavaca on January 8, 2012. McDonas will be joined by three of our major local musicians, all of whom should be familiar to those who follow “bleeding edge” activities: Gino Robair, Lisa Mezzacappa, and Christina Stanley. The title of the Oliveros memorial is “Trio Music Minus One,” a wistful reminder of how Oliveros could be as adept in her wordplay as she could be in her music-making projects. True to the title, the piece is a duo that McDonas will perform with Robair. Both performers will play on instruments with electronic enhancement, Robair on a drum set augmented by electronics and McDonas at the keyboard with analog effects. The score evokes Oliveros’ interest in sonic spaces; and the “Minus One” suggests that the trio is completed by her spirit. Scodanibbio will be remembered through a performance of “Evolutions For Stefano.” The piece grew out of a series of structured improvisations that McDonas performed with Scodanibbio in 2010, playing on Claude Debussy’s piano at the musée Labenche in Brive-la-Gaillarde in France. Before he died Scodanibbio invited McDonas to realize those structures with three Italian string players at a festival in Macerata in central Italy. Because those structures were now enduring beyond their initial role in 2010, this may have been when McDonas attached the title “Evolutions for Stefano.” On this occasion the structures will be realized as a trio, with McDonas playing with Mezzacappa on bass and Stanley on violin (and possibly vocalizing). This performance will begin at 8:30 p.m. on Saturday, May 13. The Lab is located in the Mission at 2948 16th Street. The venue is on the south side of the street, a short walk east of the corner of Mission Street. This location is particularly good for those using public transportation, since that corner provides bus stops for both north-south and east-west travel as well as a BART station. General admission will be $15, and members of The Lab will be admitted at no charge. Doors will open at 8 p.m.; and, because demand tends to be high, advance registration is highly recommended. Members can register through their login Web page, while others can use the guest registration Web page. Last night in the Concert Hall of the San Francisco Conservatory of Music (SFCM), the Opera and Musical Theatre Program joined forces with the Historical Performance Department to present an evening of two sharply contrasting short operas. The first of these was the unabashedly farcical “Mavra,” composed by Igor Stravinsky in one of his strongest Russian moods. This was followed by Henry Purcell’s Dido and Aeneas, which sharply contrasted with “Mavra” in just about every way. Both performances were fully staged, “Mavra” by Heather Mathews and Dido and Aeneas by Jose Maria Condemi. Stravinsky originally scored “Mavra” for a full orchestra, which is how it was first performed at the Paris Opera in 1922. However, it has been arranged at least twice for smaller ensembles. Due to limitations of space, last night’s performance used the bare-bones arrangement by Winfried Radeke for clarinet (Nicolina Logan), bassoon (Jamael Smith), horn (Kyle Pompei), piano (Daryl Cooper), and bass (Erika Britto), conducted by Curt Pajer. Dido was performed by a string ensemble of Historical Performance students (including Adrian Murillo on Baroque guitar); and Corey Jamason conducted from the harpsichord. Stravinsky’s librettist was Boris Kochno, who based his text on Alexander Pushkin’s verse story “The Little House at Kolomna.” This had been made into a silent film in Russia in 1913 by Pyotr Chardynin, which may well have been the inspiration for Stravinsky’s project. It is set in the house of a widowed mother (Bethany Goldson) whose cook has just died. Her daughter, Parasha (Melissa Sondhi), is less interested in the household than the attentions of the young soldier Vasilli (Ricardo Garcia). She also has to contend with a busybody neighbor (Camille Sherman), who lives in the house next door. In order to spend more time with Vasilli, Parasha disguises him as a woman and presents him as the new cook she found, who introduces “herself” as “Mavra.” The scheme gets off to a good start but unravels after the neighbor catches Mavra taking a shave, after which Vasilli is forced to make a quick escape through the window. Rather than go for the early nineteenth century of Pushkin’s Russia, Mathews transplanted the setting to midcentury America. Her design suggested a house in a neighborhood that looked a bit like what Levittown would have looked like, had it been designed by Ludwig Mies van der Rohe. This was a bit anachronistic, since Levittown families tended not to have cooks. (They were an early generation to resort to putting frozen food in the oven. The microwave would come decades later.) Nevertheless, this inconsistency with the story was a minor detail. More important was that Mathews was as effective in establishing the nature of each of the four characters as the vocalists were in negotiating Stravinsky’s pleasantly tonal but still highly eccentric score. The result was thoroughly engaging, even if the English titles had to be read from the side of the stage, rather than from above. Dido, on the other hand, was a bit more problematic. The opera was sung in English, but no titles were provided. This posed a major difficulty deriving from both the archaic phrasings of Nahum Tate’s libretto and Purcell’s often convoluted settings of those phrasings. This may have made for a major achievement in the history of English music, but that achievement clearly rested on the familiarity of the story, regardless of how Tate chose to deliver it in words that were then set to music by Purcell. In contrast to “Mavra,” Dido involved a large cast involving not only the title characters but also Dido’s servants, a sorceress and the dark spirits she summons, and a crew of sailors. Many of these roles were taken by a chorus members, but there was also a generous amount of solo voice work. In addition, while it is relatively short (about an hour), Dido is actually in three acts with a prologue; and the second act has two scenes. Ultimately, there are five different venues in which the acts unfold. Unfortunately, Condemi was far less convincing in establishing a sense of place than Mathews had been in “Mavra.” His character development was similarly weak; and there is a good chance that anyone not already familiar with the opera would have been more than a little mystified by much of the action, particularly as it pertains to the circumstances behind Aeneas’ departure. Coherence thus depended primarily on the diction of the singers, which was, for the most part, effective and, in the case of the title characters (Molly Boggess and Andrew Ross) much more than adequately convincing. The instrumental ensemble tended to be a bit ragged, but cellist Eugenio Solinas provided an impressively shaped repeated bass line to reinforce the tragic impact of Boggess’ performance of Dido’s lament at the opera’s conclusion. This production will be given a second performance tomorrow, Sunday, April 30, at 2 p.m. It will again take place in the SFCM Concert Hall, which is located at 50 Oak Street, a short walk from the Van Ness Muni station. Admission will be free, and neither reservations nor tickets will be required. Music after the Fall is the first book to survey contemporary Western art music within the transformed political, cultural, and technological environment of the post–Cold War era. This turns out to be a prescient symptom of what anyone who commits to reading this book is likely to identify sooner rather than later, a plethora of inaccuracies that most likely are the product of the deadly embrace of poor writing and poor editing. Using that Web page as a point of departure, the inquiring mind will quickly discover that Seth Brodsky’s book From 1989 or European Music and the Modernist Unconscious jumped that gun by about a week or two, which might be attributed to statistical insignificance, were it not for the fact that Brodsky’s book was also published by University of California Press! However, those interested in a wider margin will find it in Jonathan Kramer’s Postmodern Music Postmodern Listening, which was first released in hardcover by Bloomsbury Academic in August of 2016. Furthermore, most of the book had been written before Kramer died in 2004 and the task fell to Robert Carl to edit a readable text. None of this should be surprising when one considers Rutherford-Johnson’s primary thesis, which is that the prodigious innovations of technology that followed the fall of the Berlin Wall led to the emergence of a “music culture” heavily dominated by the marketplace. Note that Rutherford-Johnson never explicitly mentions that the “fall” of his title refers to the Berlin Wall. Indeed, he never really says very much about any fall. I ran a few spot checks with some young people who are just beginning to try to rev up a career in music. I showed them the cover of the book and asked if they could make the connection between the year 1989 and the word “fall” in the title. None of them could. That thoroughly unscientific test discloses an issue about the dominant marketplace that Rutherford-Johnson never considers. Jürgen Habermas’ magisterial The Theory of Communicative Action includes a lengthy chapter in which the author pulls together a “diagnosis of the times” based on multiple sources of the writings of Max Weber. His analysis concludes that a capitalist society whose value system is based only on market value is fated to suffer two different kinds of loss: loss of meaning and loss of freedom. This is an insight that reaches far beyond the study of social science as an academic discipline. One has only to read Robin D. G. Kelley’s Thelonious Monk: The Life and Times of an American Original to appreciate how much freedom Monk lost after he signed with Columbia. As to loss of meaning, Rutherford-Johnson’s book can easily stand as a case study. Referring again to the Amazon Web page, we read that “Rutherford-Johnson is a London-based music journalist and critic.” From this we can assume that he has written and probably continues to write about music in great abundance. However, the text of this book seems to indicate that his writing is, for the most part, based on artifacts. 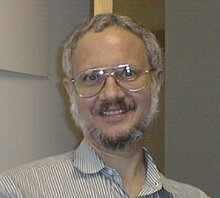 Those artifacts may very well include both audio and video recordings, as well as scores and other text documents by and about the composers covered in his book. However, there are few, if any signs, that he has ever written about the immediate experience of listening to a performance of any of the works covered in this book. I do not make this accusation lightly. Thanks to performing groups like the San Francisco Contemporary Music Players and a generous number of venues in this city which one may visit to go out on the “bleeding edge” of adventurous music making, I discovered that I had attended performances of more of the works discussed in this book than I had expected. In almost every one of those cases, I found it hard to believe that Rutherford-Johnson had enjoyed the benefit of a similar experience, leading me to believe that he was relying more on text sources (inevitably written for promotional purposes) than on the actual acts of listening. This left me questioning what he said about any of the composers examined in this book, hence my conclusion about loss of meaning. Unfortunately, one does not have to dive deep into the repertoire of performances to find evidence of sloppy editing. My favorite blooper comes in the final chapter when Rutherford-Johnson confuses Florestan, the alter ego of Robert Schumann, with the heroic political prisoner in Ludwig van Beethoven’s Fidelio. One would have thought that anyone used to editing texts about classical music would have been able to spot this a mile away. Guess not. Most likely this book as an unfortunate case of an author biting off more than he could chew. It would be interesting to see a collection of his published reviews. I would hope that he has the chops to provide coherent and readable accounts of his own first-person experiences. Trying to translate those experiences into some kind of hypothesis about a new world order, on the other hand, is definitely not in his wheelhouse. Over the past few seasons there has been an interest among San Francisco Performances (SFP) recitalists in exploring music written by composers towards the ends of their respective lives. András Schiff led the way with a three-concert series (co-hosted by SFP with the Great Performers Series of the San Francisco Symphony) in which he explored the last three piano sonatas composed by the four major “First Viennese School” composers: Wolfgang Amadeus Mozart, Joseph Haydn, Ludwig van Beethoven, and Franz Schubert. That project concluded in October of 2015; and it was followed this season by the four Late Style recitals that pianist Jonathan Biss gave with a prodigious diversity of colleagues. Last night SFP concluded its Virtuosi Series with a recital by British cellist Steven Isserlis accompanied by Canadian pianist Connie Shih; and the program could easily have been taken as an “appendix” to Biss’ project. Isserlis organized his program around three cello sonatas, each by a composer from a different stylistic period but all composed late in life. The earliest of these was the Opus 65 sonata in G minor by Frédéric Chopin (who died in 1849), composed between 1845 and 1846. At the other end of the Romantic period, Isserlis played the Opus 117 (second) sonata, also in G minor, by Gabriel Fauré. Ironically, this counts as twentieth-century music. Fauré died at the age of 79 in 1924. Furthermore, he had a major spurt of productivity that began in 1915; and the Opus 117 sonata was composed in 1921. Thus, the “modern” sonata on the program, composed by Claude Debussy in D minor, actually predates the Fauré sonata. Late in his life Debussy began a project to compose six chamber music sonatas for different instruments. The cello sonata was the first of these, composed in 1915; and Debussy died in 1918, having completed only three of the sonatas. The chamber music side of the Chopin catalog is remarkably sparse. Ironically, all of it involves the cello. In addition to the duo he composed jointly with Auguste Franchomme, there are two very early works, the Opus 3 “Introduction and Polonaise brillante” for cello and piano in C major, written between 1829 and 1830, and the 1830 piano trio in G minor (Opus 8). Then there is the Opus 65 sonata. Multiple-movement compositions of an extended duration were never in Chopin’s comfort zone. However, illness had already taken over Chopin’s body by 1845; and that confrontation may have steeled his resolve to return to a traditional extended form and really make it work. The result is that there is a far steadier control of exposition, development, and recapitulation in the opening encounter that is encountered in any of his other sonata allegro movements. With the following Scherzo, he is on more familiar ground; and the Largo could almost be another nocturne that happens to be scored for cello and piano. This leaves the Finale movement, which neatly ties up the entire package with a brisk (and, at time, rollicking) Allegro. As might be guessed, the piano part for this sonata kept Shih busy. There are any number of familiar tropes there, and Shih handled them all deftly without ever giving the impression that this was a piano composition with an obligato cello part. For his part, Isserlis always seemed to find just the right way to phrase Chopin’s cello line, never short-changing the expressiveness without ever getting bogged down in excess syrup. Playing as a duo, Isserlis and Shih made a clear case that this was the “late work” of a composer determined to summon all of his resources in the pursuit of a new path. Fauré, on the other hand, was a much more prolific composer of chamber music; and that genre occupied him throughout his life. However, most of his music for cello and piano tended to be short salon-style pieces. Both of his cello sonatas were not written until that burst of activity that begin in 1915. Opus 117 is the more compact of the two; but he had no trouble maintaining his “old school” ways in his approach to thematic content and harmonization. One might almost say that there is a yin-yang relationship between Opus 117 and the Debussy sonata, the latter breaking with all the traditional structural principles of the former, almost as if Debussy were turning to a narrative line for his structure rather than any of the building blocks of the nineteenth century. For all of that opposition, however, Isserlis’ approach to both of these sonatas made a clear case that each composer had his own coherent strategies for exploring the expressive qualities of the solo instrument. Thus, having these two works share the same program amounted to an ingenious illustration of just how things were changing during the first quarter of the twentieth century. Indeed, both of these sonatas could easily serve as “supporting context” for the major effort in French literature that was unfolding while these pieces were being written, Marcel Proust’s In Search of Lost Time (À la recherche du temps perdu). Thus, the idea of underscoring the complementary relationship between Debussy and Fauré with a nod to Proust was a stroke of genius. That nod came at the very end of the program with Thomas Adès’ Opus 26, his four-movement “Lieux retrouvés” (re-found places). Isserlis was actually the one to call out Proust in the spoken introduction that preceded his performances; but, in doing so, he hit on a fascinating parallel. Those who know a bit of French probably recognize chercher as the verb for “to seek,” while trouver is the verb for “to find.” Isserlis’ introduction seemed to suggest that, just as Proust added the “re” prefix to chercher, Adès had done the same for trouver. Thus, Isserlis suggested that Adès was seeking a way to explore memory through music as Proust had done through writing. However, if Proust’s memories were triggered by a madeleine dipped in tea, each of the four movements of “Lieux retrouvés” involves a different sense of place as a memory source. The first deals with “views” of a variety of different bodies of water and the dynamics of their movements. The second approaches impressions of a mountain through the eyes of mountaineers. The third is a pastoral interlude that precedes the bustle of a large city, expressed as a “Cancan macabre.” This last movement imposes diabolical demands on the performers; but their command of the music was so secure that it was easy to enjoy of the humor of Adès madcap rhetoric. For those who attend SFP recitals regularly, it is worth noting, as an aside, the sharp contrast between Isserlis’ approach to Adès and that of the Calder Quartet’s performance about two weeks earlier. Both performances provided excellent accounts of what I had previously called Adès “awesome wealth of intricate clockwork precision.” However, Calder never managed to grasp any of the narrative qualities in their performances of the two Adès selections. One might say that Isserlis’ understanding of Adès included a semantic dimension that had eluded the Calder readings. (I had encountered a similar problem when listening to the Calder performance of Béla Bartók in 2014.) Isserlis’ impressions on the listener run deep by virtue of his appreciating and manifesting qualities that go beyond the marks on the paper into a far broader domain of understanding, and those qualities are responsible for his performances being so compelling. There were, fortunately, some lighter moments in the evening. The intermission was followed by Reynaldo Hahn’s arrangements and embellishments of two Irish airs. Similarly, Isserlis turned to Chopin’s arrangement of a Polish song for his encore. This was the last (seventeenth) in the Opus 74 collection, a “hymn from the tomb” about falling leaves, whose title in English would probably be “Faded and Vanished.” Chopin wrote this piece in 1836, but the opus number was only assigned posthumously. This selection, along with the Hahn arrangements, reminded us all of the beauty of a well-shaped melodic line and provided just the right balance against the more cerebral elements of last night’s program. When the Fête Concert Series announced the plan for its 2016–17 season, it was determined that the birthday celebrant for the final performance would be William Shakespeare; but, at the time of the announcement, a venue had not been finalized. Now that all details are in place, they may be provided. The title of the program will be To Sing or Not to Sing: Modern Composers Celebrate Shakespeare. Three composers will contribute, one with a guitar solo and the other two setting Shakespeare texts. This will be complemented by settings of Shakespeare texts intended as songs by Henze’s English contemporary, Madeline Dring, and a Shakespeare-inspired sonnet by Ted Zoldan. The most recent work on the program involves an innovative approach to Hamlet. Christian Jost composed an opera in 2008 in which the words of the title character were divided between a soprano soloist and a choir. “Hamlet Echoes” is a distillation of this treatment composed as chamber music for viola, soprano, and piano. The performers for the two vocal selections will be sopranos Chelsea Hollow and Anne Hepburn Smith. The instrumentalists will be pianist Paul Dab and violist Erica Zappia. The original plan had been to present this program tomorrow, since Shakespeare was baptized on April 26, 1564. However, that date was changed to May 6, a week from this Saturday. The venue will be the Center for New Music (C4NM), located at 55 Taylor Street, half a block north of where Golden Gate Avenue meets Market Street. The performance will begin at 8 p.m. with a pre-concert reception at 7:30 p.m. General admission will be $20 with a $10 rate for students, seniors, and C4NM members. Tickets may be purchased in advance online through a Vendini event page. The reception will offer wine, cheese, and dessert; and, because this is a birthday event, as is always the case at Fête Concerts events, a party hat will be included! Tomorrow Brilliant Classics will release the latest stage in a major project to record the complete madrigals of Claudio Monteverdi. The project was launched in 2008 by the Dutch early music group Le Nuove Musiche, whose Artistic Leader is Krijn Koetsveld. It began with the recording of the fifth and sixth books of madrigals, released in January of 2014 as a two-CD set with one book on each CD. The project then continued in conjunction with the planning and realization of the Monteverdi XL festival in Amersfoort, whose performances this coming June will mark the 450th anniversary of Monteverdi’s birth. Subsequent recordings have proceeded in an “inside out” traversal of the books of madrigals. A two-CD album of the seventh book was released in January of 2016, followed by the release of the third and fourth books in a single album, each again with its own CD, in May of 2016. Tomorrow will see the release of the eighth book. This book, which was given the title Madrigali guerrieri et amorosi (madrigals of war and love), was Monteverdi’s most ambitious project; and he worked on it for about 30 years. The book is in two sections following the ordering of the title, beginning with war and followed by love. As usual, those too impatient to wait for tomorrow can pre-order this new recording through its Web page on Amazon.com. Those familiar with the genre know that, for the most part, madrigals are relatively short compositions setting equally brief poems for one or more voices, usually with optional instrumental accompaniment. Where the eighth book is concerned, however, Monteverdi takes on longer durations and more attention to the instrumental side. This is particularly the case in the war section, which includes “Il Combattimento di Tancredi e Clorinda” (the combat of Tancredi and Clorinda). The text is taken from the twelfth canto of Torquato Tasso’s epic (and predominantly mythic) account of the First Crusade, Jerusalem Delivered. About twenty minutes in duration, this single madrigal comes close to being a one-act opera. Indeed, Luciano Berio produced it that way with a staging that I was fortunate enough to see performed at Harvard University during my undergraduate years. Unlike most of the madrigals, this score involves dramatic exchanges between the vocalists presenting Tasso’s text and the instrumental accompaniment, which accounts for both the setting and the action. The vocal lines are all solo, divided among the two protagonists and a narrator. (Berio set his performance in a boxing ring with the narrator serving as the referee.) In this context it is worth observing that Monteverdi began his work on the eighth book shortly after the first performance of L’Orfeo and completed it about a decade before the performances of Il ritorno d’Ulisse in patria (the return of Ulysses) and L’incoronazione di Poppea (the coronation of Poppea). Another unique aspect of the eighth book is that each of the sections has a “song and dance” conclusion. The war section concludes with dance music framed on either side by a poem by an unidentified author. The opening text begins “Volgendo il ciel per l'immortal sentiero” (turning to heaven for the immortal path), while the concluding verse begins “Movete al mio bel suon” (moving to my beloved). Thus, the section concludes by setting aside thoughts of war and complementing the perspectives of heaven and earth, concluding in favor of the earth! The love section, on the other hand, concludes with “Il ballo delle ingrate” (ballet of the ungrateful women), with vocal parts for one bass (Pluto) and three sopranos (Venus, Cupid, and one of the ungrateful women). This is another dramatic setting that, with a duration of more than half an hour, can also stand on its own as a one-act opera. As with the previous recordings, there is nothing to fault in the performances by Le Nuove Musiche under Koetsveld’s leadership. The only problem concerns how the individual madrigals are distributed across the three CDs. The first accounts for everything in the war section except the concluding ballet, which is saved for the final track of the third CD. The love madrigals, on the other hand alternate between the second and third discs, with the “Ballo delle ingrate” concluding the second CD. To be fair it is unlikely that Monteverdi ever intended all of these madrigals to be performed as a beginning-to-end traversal of the book, and this is probably just as true of the two individual sections. The division probably involved what would fit best on the available space; and, most likely, the only listeners likely to feel inconvenienced will be the score followers! For some unexplained reason this week’s BayImproviser Calendar never made it to my Inbox. Actually, there probably is a reason, which is that the phrase “software quality” becomes more and more of an oxymoron as it comes to receive less and less attention as part of coding training. As this site has often observed, the world of increasing tolerance to increasing degradation of technology envisaged by E. M. Forster in “The Machine Stops” has become very much with us; but, like Forster’s characters, we are too dependent on the services being provided to notice. In other words both the service providers and those intended to benefit from those services end up suffering in equal measure. However, while there may not have been a Bleeding Edge summary for this week, it is still important to note the next adventurous concert scheduled at The Lab. This will be a visit from Susan Alcorn, whose performances on pedal steel guitar are worthy of the “virtuoso” adjective. Like many who play the instrument, Alcorn built up her chops in Texas as a member of a variety of country and western bands. However, her approach to the instrument gradually began to expand through an impressive variety of influences. On the classical side she took a great interest in Olivier Messiaen, Edgard Varèse, and Krzysztof Penderecki, while also looking into the avant-garde activities of Pauline Oliveros. As an improviser she paralleled those interests by following the free jazz pursuits of John Coltrane and Ornette Coleman. She then added a variety of world music sources to her knapsack, including Indian ragas, South American songs, and Indonesian gamelan. For her visit to The Lab she will be joined by local saxophonist and composer Phillip Greenlief, who should be well known to those seeking out “bleeding edge” activities in San Francisco. The performance by Alcorn and Greenlief will begin at 8:30 p.m. this Saturday, April 29. The Lab is located in the Mission at 2948 16th Street. The venue is on the south side of the street, a short walk east of the corner of Mission Street. This location is particularly good for those using public transportation, since that corner provides bus stops for both north-south and east-west travel as well as a BART station. General admission will be $15, and members of The Lab will be admitted at no charge. Doors will open at 8 p.m.; and, because demand tends to be high, advance registration is highly recommended. Members can register through their login Web page, while others can use the guest registration Web page. The third concert in the Piano Series prepared by San Francisco Performances, (SFP) presented last night in Herbst Theatre, promised to be one of the high points of the season. Two of the most distinguished pianists in the current concert scene, both familiar to those who have attended SFP events, joined forces to present a program of music composed for four hands distributed across two keyboards. The pianists were the Norwegian Leif Ove Andsnes, making his tenth SFP appearance and Canadian Marc-André Hamelin, making his twelfth. Furthermore, both had previously appeared not only as a soloist but also in chamber music settings. Both have experience in accompanying a soloist and in playing in larger ensembles, particularly those involving two, three, or four string players. The program prepared for the occasion was just as promising. Igor Stravinsky was the main contributor, with the second half being devoted entirely to his music for Vaslav Nijinsky’s ballet “The Rite of Spring.” The first half, in turn, presented the concerto for two pianos that Stravinsky wrote between 1934 and 1935 to play with his son Soulima. Even the two encore selections of the evening, “Madrid” and “Circus Polka,” were Stravinsky selections. Stravinsky’s presence was complemented by that of Claude Debussy’s “En blanc et noir” (in black and white). The Stravinsky-Debussy connection was particularly apposite, since Debussy had been Stravinsky’s partner when the “Rite of Spring” score was first performed for Nijinsky and Sergei Diaghilev in the composer’s draft version for four hands on a single keyboard. The program also included a piece by Wolfgang Amadeus Mozart so rare that it never appeared in Ludwig Ritter von Köchel’s catalog. Sadly, none of this ever managed to gel with the immediacy and intimacy one expects from a chamber music experience. One problem may have been physical separation. The pianists had to face each other across a distance slightly longer than the length of a concert grand. This distance is far greater than that between a pianist and the string players in a trio, quartet, or quintet. The result was a sense that each pianist was more occupied in the challenges of his own part than with arriving at a whole that would be greater than the sum of its parts. To be fair, the technical challenges last night were legion; but there was too much of a sense that each challenge was conquered by hammering it out with vigorous determination. As might be guessed, Mozart’s music suffered the most from such treatment, particularly when one considers that the pianos themselves were far too large for the sort of music being played. Curiously, the music that fared best was the Debussy score. The Debussy canon for solo music is not only prolific but, when considered in its entirety, impressively diverse. Debussy also composed for both four hands on one keyboard and two pianos. He devoted more attention to the former genre, whose best known result would probably be his Petite Suite. However, in “En blanc et noir” he was clearly going for a more powerful sound, almost as if his goal had been to achieve the strength of an orchestra through keyboard technique. The result was a panorama of broad strokes that would probably surprise anyone whose knowledge of Debussy’s rhetoric was restricted to his solo piano music. Both Andsnes and Hamelin were not shy in rendering those bold strokes, thus presenting a new viewpoint of Debussy’s character that emerged as a perfectly valid extension of his single-keyboard music. Each of the Stravinsky selections, one the other hand, was problematic in its own way. The fact is that the four-hand account of “The Rite of Spring” that Stravinsky and Debussy introduced by Nijinsky and Diaghilev was a highly effective distillation of the full score (which Stravinsky created by orchestrating the four-hand version). As was clear when the ZOFO duo of Keisuke Nakagoshi and Eva-Maria Zimmermann played this version at their first public concert, given at the San Francisco Conservatory of Music, there was an element of transparency that would fog up once Stravinsky began to pile on the instruments. Last night’s performance, on the other hand, while capturing much of the violently raw energy of the orchestral version, never made a convincing case for the music at the heart of all that raging. Where the concerto was concerned, at least the issue of having the right resources for the right music was properly resolved. What was missing, however, was any recognition that Stravinsky might have approached this music with more than a little wit. If he wrote it to play with his son, then it would be nice to believe that some kind of “bonding” was at least a secondary objective. There is a playfulness that can be found in each of this concerto’s four movements that suggests that Stravinsky approached this score as a vehicle for father-and-son intimacy, even if he had no other such resource at his disposal. Sadly, neither that intimacy nor the use of wit as a vehicle for it was evident last night. The performance was all about mastering the technical challenges. However, what obtained had more to do with beating those challenges into submission than meeting them on their own terms. That sort of wit only emerged in the encore selections, each of which involved Stravinsky poking fun at one or more other composers. In the case of the first encore, “Madrid,” the composer was Emmanuel Chabrier and the music was his “España” rhapsody. Ironically, Chabrier had composed a two-piano transcription of his orchestral score. Stravinsky decided to do him one better, composing “Madrid” for pianola; and Soulima later prepared a two-piano transcription. “Circus Polka,” on the other hand, began as a piano solo. It was written for choreographer George Balanchine, when Balanchine received a request from the Ringling Bros. and Barnum & Bailey Circus to create a ballet for fifty elephants and fifty ballerinas. David Raksin then arranged the score for organ and concert band. Stravinsky subsequently prepared his own orchestral version, and Victor Babin arranged the score for two pianos. The score is best known for an outrageous treatment of the first of Franz Schubert’s D. 733 three “Marches militaires” in D major; but there is also an unmistakable jab at Pyotr Ilyich Tchaikovsky’s Opus 36 (fourth) symphony in F minor. These were the sorts of high spirits that could have gone a long way towards endowing the two-piano concerto with the rhetoric it deserved. This site has made it a point to track the progress of the multiple concert series organized for the 2017 season of Sunset Music | Arts. However, next month Sunset Music | Arts will host an additional evening that will offer not only a recital but also the opportunity for conversation with the recitalist. That recitalist will be Pablo Estigarribia, an Argentinian virtuoso tango pianist, arranger, and composer. The recital will be organized around Estigarribia’s album Tangos para Piano (tangos for piano), which is based on a solo piano book he prepared and received the Carlos Gardel award. The conversation will begin with a short lecture on the history of the tango supplemented with demonstrations from the keyboard, after which Estigarribia will entertain questions from the audience. This event will mark the beginning of Estigarribia’s first West Coast tour. An Evening with Pablo Estigarribia will begin at 7 p.m. on Sunday, May 14. Like other Sunset Music | Arts events, it will take place at the Episcopal Church of the Incarnation, which is located at 1750 29th Avenue, about halfway between Moraga Street and Noriega Street. Ticket prices are $20 for general admission with a $15 rate for students and seniors. Because the demand tends to be high, advance purchase is highly advised. Tickets may be purchased online through an Eventbrite event page. Further information may be obtained by calling 415-564-2324. Last night in Herbst Theatre, Chamber Music San Francisco presented the San Francisco premiere of Quatuor Danel, a Brussels-based string quartet, whose members are Marc Danel, the leader after whom the group is named, second violinist Gilles Millet, violist Vlad Bogdanas, and cellist Yovan Markovitch. The ensemble currently holds two residencies, one at the University of Manchester (since 2005) and the other (as of October of last year) at the TivoliVredenburg music complex in Utrecht. Their extensive touring is gradually being matched by an impressive recorded legacy, which already includes the first recording ever made of all seventeen of the string quartets composed by Mieczysław Weinberg. Their current extended recording project involves the late quartets of Ludwig van Beethoven. Both Weinberg and Beethoven were represented on last night’s program. However, the French-Belgian side of the group’s underlying culture served as the basis for the opening selection, Claude Debussy’s Opus 10, his only string quartet, which he composed in 1893. From the very opening gesture, it was clear that this ensemble was driven by an intense command of energy. Debussy’s tempo marking for his first movement is Animé et très décidé (animated and very decisive); and Danel was committed to every letter of that instruction. Without ever short-changing any fundamental matters of pitch, intonation, and rhythm, Danel almost immediately exposed just how lame more “polite” accounts of this quartet can be. Whether the issue was counterpoint, bowing technique, or even overall structure, Debussy was as decisive in taking his own personal approach to the nature of the string quartet as his marking for the opening tempo was. Through Danel’s interpretation, one could appreciate a radical side to Debussy’s aesthetic that is often overlooked in his more popular compositions. The result was almost shockingly harsh, startling but not offending, leaving most of the audience with the impression that they were hearing his music for the first time, no matter the number of past encounters with recitals and recordings. That rhetorical stance also proved to serve the Beethoven selection, Opus 130 in B-flat major, just as well. This was Beethoven’s major venture into an extended number of distinct movements; and the venture was even bolder when the quartet concluded with the “Große Fuge,” whose scope was so ambitious that Beethoven finally gave in to his publisher, composing a shorter final movement (the last substantial composition before the composer’s death) and publishing the fugue separately as Opus 133. However, even with that modification for the conclusion, Opus 130 is a panorama of diverse styles, rhetorics, and durational scales. Furthermore, its shifts across that diversity are often abrupt, sometimes shockingly so; and what made Danel’s approach so compelling was the group’s ability to negotiate those shifts without ever making them sound awkward or unnatural. Thus, while this quartet often labors under interpretations that begin to wear on the listener’s patience long before the final movement, this was an account that left that same listener on the edge of his/her seat, eager to learn what would next ensue. The Weinberg selection was the Opus 27 quartet in B-flat major. Composed in 1945, this was the fifth of the seventeen quartets. Weinberg’s friendship with Dmitri Shostakovich coincided with the coming of World War II to the Soviet Union. While Weinberg had initially been evacuated to Tashkent, Shostakovich persuaded him to move to Moscow. Weinberg would have been aware of the accumulating rhetoric of war-weariness that was building up in Shostakovich’s symphonies at that time; and he probably had also encountered Sergei Prokofiev’s “war” sonatas for piano. However, the Opus 27 quartet has the same sort of lightness of spirit that emerged in Shostakovich’s ninth symphony. Each of its five movements is relatively short and might be taken as an individual character sketch. In at least two cases that character may have been specific. The second Humoreska movement can easily be taken as a warped reflection on the seventh, and most popular, of the eight humoresques that Antonín Dvořák composed for solo piano as his Opus 101, while the following Scherzo is an almost unmistakable nod to Shostakovich. Danel’s interpretation seemed to appreciate this approach and endowed each movement with its own personality type. (They had no trouble evoking Shostakovich’s spirit.) This was probably a “first contact” experience for much of the audience; and Danel could not have provided a better introduction. One could appreciate the uniqueness of Weinberg’s own voice while acknowledging his previously neglected status as a Polish-born Russian composer. Last night’s performance may well have encouraged some to seek out the Danel recording of the complete set of Weinberg quartets. The encore selection was a “Notturno” movement, apparently from a string quartet by Jacques Ibert. Details have been hard to find. The music provided a quiet follow-up to the joyous Finale movement of Beethoven’s Opus 130. It also allowed for a return to those Franco-Belgian roots that shape this group’s personality and were most evident in their approach to Debussy. Most importantly, it provided an elegant conclusion to the ensemble’s visit, leaving many of us wondering when this ensemble will return. The title of the next program prepared by the International Orange Chorale of San Francisco (IOCSF), the only ensemble to have named itself after the color of the Golden Gate Bridge, is Freshly Squeezed: New Music by and for IOCSF. This title refers to last year’s launch of the Freshly Squeezed Composition Competition, whose submissions were reviewed and evaluated at the beginning of this year. The grand prize winner was David Avshalomov, who submitted “O Euchari.” This is a setting of Hildegarde of Bingen’s ecstatic vision of the Eucharist from the second part of her first work, Scivias, which consists of texts, miniature illustrations, and songs. Avshalomov has drawn upon the chant practices of Russian Orthodox liturgical music. Two “runner-up” submissions will also be performed. “Elohim Hashivenu” is a setting of the Hebrew text of Psalm 80 composed by Salvatore LoCasio, which draws upon the choral version of tone clusters. By way of contrast, “Strings in the earth and air” is a lyrical setting with poignant dissonances of the first poem in James Joyce’s Chamber Music collection by Bryan Lin. Composer-in-Residence Elliott Encarnación will contribute to the program with “The Mariner,” his distillation of verses from Samuel Taylor Coleridge’s The Rime of the Ancient Mariner. In addition IOCSF soprano Elizabeth Kimble”s “The Peace of Wild Things,” a setting of a text by Wendell Berry, will also be performed. These five premiere performances will be complemented by four pieces new to the Bay Area. One of these is by IOCSF Joshua Saulle, currently a doctoral candidate in composition at the University of California in Los Angeles. IOCSF will sing his setting of verses from the Song of Songs, “Arise, my love.” The other three Bay Area premieres will be “Love, thricewise” by Joe Gregorio, a setting of the Latin text of the Lord’s Prayer by Ivo Antognini, and “Ne irascaris, Domine” by Frank LaRocca. As usual the conductor will be Zane Fiala. This concert will begin at 7:30 p.m. on Saturday, May 13. The venue will be St. Matthew’s Lutheran Church at 3281 16th Street, located in the Mission. Admission is free, but donations are always welcome. The title of yesterday’s Old First Concerts program at Old First Presbyterian Church was Arm Sized Legging, the name of a project conceived by jazz saxophonist Matt Renzi. The idea was to expand the usual trio based on a rhythm section of bass (John Wiitala) and drums (Hamir Atwal) with two string players, Lucy Southern on violin and Helen Newby on cello. The motivation was to explore the opportunity for richer instrumental textures and colorations. All of the pieces played yesterday were Renzi’s original compositions. While this was an appealing idea, its realization was not particularly compelling. For the most part the strings, when they performed at all, did little more than add some highlighting to the instrumental sonorities of the trio. Part of the problem was that they were unamplified. While Old First has excellent acoustics, the decibel power of Renzi’s saxophone and Atwal’s drumming tended to flood the sanctuary (and every good jazz group knows that everyone backs off when the bass takes a solo). The result was that the violin and cello sounded like the alto and tenor sections of a choir that was not particularly well balanced. Furthermore, neither Southern nor Newby was given an opportunity to improvise along with the other members of the group. For that matter Southern’s appearance was minimal, playing in only a few selections on either side of the intermission. She did not even come out for a final bow. Newby had the advantage of playing a duo with Renzi called “Family Picnic.” This gave her an opportunity to explore many of the alternative techniques that she seemed to command very well, and her sonorities tended to suggest that Renzi’s goal had been to depict the ants’ point of view of the picnic in his title. In just about every other setting, however, Newby tended either to follow Wiitala’s line or add a subdued harmonizing voice. As to Renzi himself, his compositions tended to be at least moderately engaging but not particularly enduring. The same could be said of his saxophone improvisation work. In this context it was probably fortunate that his compositions tended to be on the short side. Since he was not that adventurous, there was no need for him to invest too much time in exploration. The overall result was a relatively brief program of original jazz music that offered more than a few pleasures but resulted in little that remained in memory after the hall had emptied. As was observed yesterday, May 14 will mark the 100th birthday of composer Lou Harrison. This weekend the San Francisco Contemporary Music Players (SFCMP) got the jump on the occasion with a festival entitled Lou Harrison: A Centenary Celebration, which included three concerts yesterday at Z Space taking place late in the morning, during the afternoon, and in the evening. The morning concert was devoted to the three winners’s of SFCMP’s SF Search competition, but each of the other two concerts featured two significant Harrison pieces sharing the program with works by two living composers. Over the course of yesterday afternoon’s program, I realized that there was so much richness in Harrison’s compositions that I was already saturated with thoughts before it was even time to break for dinner. The two pieces provided excellent representation of the exploratory mindset behind his early work (the third of his “Canticle” pieces, composed in 1942) complemented by a piece that was not only much more recent (the “Varied Trio” of 1986) but also written for SFCMP musicians: percussionist William Winant, pianist Julie Steinberg, and violinist David Abel. Furthermore, Winant was on hand to lead yesterday’s performance, joined this time by pianist Kate Campbell and violinist Hrabba Atladottir, who was called upon to substitute for Roy Malan with about 24 hours to learn her part. While we tend to think of Harrison in terms of his inventive approaches to melody, counterpoint, and rhythm, it is also worth acknowledging just how much diversity went into his use of that adjective “varied.” Obviously, the variety in his choice of instruments is not a conventional one; but that is just the tip of the iceberg. Each of the players is required to perform in a variety of different ways. This was most evident in Winant’s case, since he had to alternate between two different stations outfitted with different arrays of percussion instruments. However, Campbell had to work with far more than the keyboard, not only reaching inside the piano to both stroke and strike the strings but also using her mallet to provide her own contribution to the percussion by striking the bottom of the sounding board. Even Atladottir had to work with variety, required to use only pizzicato for the second movement. Finally, there was considerable variety in the styles of the movements themselves, alternating between Oriental references, eighteenth-century dances, and a highly chromatic (and very twentieth-century) elegy. As had been the case when he performed with pianist Sarah Cahill and violinist Kate Stenberg at the San Francisco Conservatory of Music this past November, Winant took responsibility as leader. Indeed, one might add to that “litany of variety” the richness of body language that seemed to inform Winant’s approach to execution, since that body language also did much to communicate his thoughts about expressiveness to the other two players. The result was an excitingly vibrant execution that firmly established the significance of this composition in the repertoire of twentieth-century music. The musical texture is composed of a number of small rhythmicles and melodicles woven together (so to speak) into a form which is roughly a-b-a in shape. As might be guessed, a “rhythmicle” is basically a very small rhythmic motif (or cell); and a “melodicle” is basically the same sort of thing for a melody! Yesterday afternoon the guitar was played by SFCMP guitarist David Tanenbaum, and the ocarina was taken by SFCMP clarinetist Jeff Anderle. The percussionists included Winant along with Jim Kassis, Haruka Fuji, Stan Muncy, and Loren Mach. While many of the percussion instruments were pitched, Harrison’s melodicles were defined more by contour than by conventional melodic structure. Once again, much of the expressiveness of the performance came from Winant’s body language; but it did not take much for the other performers to get into the same spirit of things. Readers may recall that this piece was also performed this past February at the first Other Minds 22 concert. That performance took place in the Mission Dolores Basilica, whose acoustics were definitely suitable for the occasion. However, the altar space was arranged in such a way that one could barely make out the individual performers. Z Space seating, on the other hand, was steeply raked; and the performers were arrayed in a semicircle, allowing everyone to make eye contact with everyone else. This enhanced visual setting, which allowed one to see how the performance involved exchanges across ever-changing groupings of the players, made for a far more compelling listening experience; and the acoustics were just as favorable. Of the two current composers on the program, Annie Gosfield’s “Daughters of the Industrial Revolution,” composed in 2011, was the more striking, if only for Mach’s energetic percussion work (pun intended). The composition was a duo for percussion and cello (Stephen Harrison); and one has to wonder if there was a bit of prankishness in that pairing. Indeed, were it not for the fact that ours has become a culture that seems to take pride in its ignorance of history, I would have assumed that Gosfield’s title was tweaking the Daughters of the American Revolution (DAR). Anyone aware of this group, whose motto is “God, Home, and Country” and whose demographic (at least for the first century of its existence) was about as WASP (White Anglo-Saxon Protestant) as you could get, might easily have imagined that Gosfield’s music would not go down well with the DAR. My own imagination saw a staunch and upright DAR member walking out on the performance before the first minute elapsed, stubbornly puzzled when she saw that no-one was following her! Gosfield’s work is, as they would say, not your grandmother’s chamber music. The prevailing dynamic is loud, and the rhythms are aggressively driving. Somewhat surprisingly, Harrison’s command of that dynamic was as strong as Mach’s, making for an awe-inspiring sense of balance maintained by the two of them. There is an awareness of rock rhetoric, but the music definitely has its own voice. It is also one hell of a lot of fun. Given the precision with which Mach and Harrison had to coordinate, I am not sure if they had as much fun as the listeners; but this was definitely the way to end yesterday afternoon’s concert with a bang. The other recent work was Jimmy Lopez’ “Ccantu,” composed in 2007 and played at the piano by Campbell. The title is the Quechua name for the national flower of Peru; and, over the course of a modest six minutes, the music depicts the life cycle of this flower. This was definitely the quietest part of the program; and, if the music was not quite as denotative as what one tends to encounter in program music, the intimate rhetorical tone definitely captured all the right connotations. Campbell’s performance prioritized sensitivity above all else, and her quietude offered an engaging intermezzo between the two Harrison compositions in which percussion figured so heavily. Those of my generation probably recall Urania as an overseas record label that was available at shops that tended to have a generous collection of classical music albums. Apparently, Urania has designated itself “the original Italian label of classical music.” With that legacy in mind, there now seems to be a Urania Arts CD label, dedicated to rescuing recordings of historical significance from the vault and reissuing them as compact discs. The earliest of these recordings were monaural, while the later ones were stereophonic. Those who have been following my recent interest in following Richter recordings (almost all of which were taken from concert performances) know that I have been particularly attracted to the clarity that he brings to his performances, whether he is playing music as early as one of the keyboard suites of George Frideric Handel or as late as one of Sergei Prokofiev’s “war” sonatas. Where Beethoven is concerned, those who follow his piano music parallel those who follow the string quartets by dividing the canon into “early,” “middle,” and “late” periods. The producers of this album clearly wanted to stress the “late” period; and the Opus 10 selection is the only one from the “early” period. 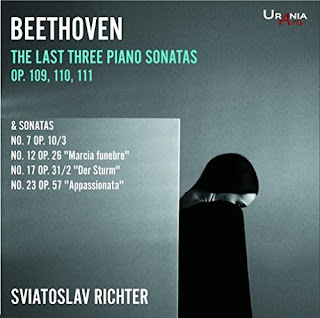 Nevertheless, there is considerable diversity across these two CDs; and it would be fair to say that, where attentiveness is concerned, Richter does not “play favorites.” Instead, he always seems to know how to home in on the ideas that Beethoven chose to explore and then disclose the resulting explorations to make them clearly evident to the attentive listener. It goes without saying that those explorations are at their most extensive in the last sonatas. Indeed, so much is disclosed in those sonatas that it can be challenging to sit through a program of all three of them without at least some of the symptoms of cognitive fatigue. Nevertheless, Richter was not the first to program them in a single recital; and he is far from the last. Thus, one of the virtues of this album is that one can listen to those sonatas individually. That attentive listener who chooses to do so will almost inevitably be drawn into how much thought has gone into each performance over such a broad range of scale. There are individual phrasings that are decidedly unique but definitely make sense on their own merits, rather than as personal idiosyncrasies. At the same time, Richter clearly knows how to negotiate those extended variations in the final movement of Opus 111 in such a way as to communicate just how inventive Beethoven was while remaining disciplined not only to the constraints of the underlying theme but also the organization of the entire movement as a coherent journey. Yes, I know there is a prodigious abundance of recordings of each of the sonatas in this collection; but these are far from “business as usual” performances, not by exploiting eccentric quirks but through a disciplined pursuit of what is actually going on amidst all of those notes. 4 p.m., St. Mark’s Lutheran Church: American Bach Soloists (ABS) will conclude its 2017 subscription season with a major oratorio performance, George Frideric Handel’s HWV 47 La resurrezione (the resurrection). This was first performed on the Easter Sunday of 1708 in Rome. As is well known, the young Handel traveled to Rome to cultivate his skills as an opera composer. Unfortunately, he arrived in Rome around the time that Pope Clement XI imposed a ban on operatic performances. However, as we know from the HWV 232 setting of Psalm 110, Dixit Dominus, which ABS performed in March of 2013, Handel did not allow the Papal ban to interfere with his exercising his operatic chops on sacred texts; and HWV 47 was sufficiently “operatic” that the Vatican did not take kindly to it. St. Mark’s is located at 1111 O’Farrell Street, just west of the corner of Franklin Street. Premium tickets are $85, and the other prices are $64 and $33. Tickets may be purchased in advance online from a Tix event page on the ABS Web site. Discounted tickets are available for students aged 25 and under with proof of identification. The tickets may be arranged by calling the ABS Office at 415-621-7900. 8 p.m., Center for New Music (C4NM): At the other end of the historical spectrum, this will be the first concert in C4NM’s MicroFest North. The program will be a solo piano recital by Sarah Cahill honoring the 100th birthday of Lou Harrison, which will take place on May 14. Cahill will perform several movements from Harrison’s piano suite, his two cembalo sonatas, and the Summerfield Set. She will also perform “Jig” and “Range-Song,” two of his earliest pieces, as well as several unpublished and rarely performed works. C4NM is located at 55 Taylor Street, half a block north of where Golden Gate Avenue meets Market Street. General admission will be $15 with a $12 rate for C4NM members. Tickets may be purchased in advance through a Vendini Web page. At the beginning of this year, Albany Records released its third recording of an opera produced by Purchase Opera, the ensemble for the performance of fully-staged operas associated with the Conservatory of Music at Purchase College, part of the State University of New York network of higher-education institutions. The production recorded on this recent release is Robert Ward’s four-act opera The Crucible, whose libretto by Bernard Stambler was, for the most part, a faithful adaptation of Arthur Miller’s play of the same name. The opera was commissioned by the New York City Opera in 1961, a time when the historical impact of Miller’s play had not yet faded from cultural memory. Miller wrote his play in 1953, a time when much of the country’s population had been stirred into a collective paranoia based on the threat that Communism would undermine the principles of government in the United States. That paranoia was fueled by investigations of “un-American activities” by both the House of Representatives and the Senate. Like many who took pride in maintaining an objective intellect, Miller was called before the House Committee, where he was convicted of contempt of Congress for refusing to provide names of other intellectuals whom the Committee felt might be threats to “the American way of life.” Many who were sympathetic to those called to testify started to refer to the search for “un-Americans” as a “witch hunt;” so Miller decided to respond to both the Congressional activities and the prevailing metaphor by writing a play about the Salem witch trials. Late in his life Miller himself was invited to write a screenplay based on his play, and the film of the same name came out in 1996. This resulted in Miller getting a Best Adapted Screenplay nomination from the Academy of Motion Picture Arts and Sciences; but the film itself was far from a box office hit, in spite of having cast Winona Ryder, Daniel Day-Lewis, and Paul Scofield. The bottom line is that the film was too talky and didactic for people who went to the movies for little more than escapism. In many respects Ward’s opera faces a similar problem, particularly today. The original New York City Opera production was released as a recording not long after its first round of performances. After than all was silence; so this new release from Albany is the first in over 50 years. The good news is that Ward had a very keen ear for setting prose, meaning the Stambler’s libretto, for its time, had the same intense impact that Miller’s original text did. However, that is also the bad news. The didacticism of the libretto is underscored by what now sounds like a dated rhetoric. Even though the opera itself reinforces a signature episode in our country’s past history, it’s message struggles to register with an audience that almost revels in its ignorance of history. By all rights, in a society in which mass mentality is more malleable than a stick of butter, the message behind The Crucible is as relevant as it was when Miller wrote his play, if not more so. The problem is that this is just not the sort of thing that the current generation of listeners wants to have coming out of their portable devices and into their earbuds. Indeed, considering what happened to that 1996 film, even a video document of the Purchase production would be unlikely to get through to much of an audience base. (Sitting still in an opera house for a couple of hours is even more out of the question.) Nevertheless, those who are sensitive to our country’s history may very well appreciate both the narrative and the musical setting in Ward’s opera; but that experience may only serve to underscore their depression in regarding the blissful oblivion of those who surround them.